Are you still saving up your Citi points to redeem miles? Now you can convert them to MoneyBack Points to pay for the things you like! From now till May 31, 2019, you can earn up to 4,000 complimentary MoneyBack Points by converting your Citi points. During the Promotion Period, each eligible Cardholder is entitled to enjoy this offer once only. This offer only applies to the first 5,000 participating Cardholders on a first-come-first-served basis. During the Promotion Period, Cardholders, who (1) download the MoneyBack App and sign up as New MoneyBack App Members (the mobile numbers registered with MoneyBack must be the same as the registered mobile numbers with Citibank), and (2) make a successful Citi Points Conversion to MoneyBack Points on MoneyBack App, are entitled to receive extra 1,500 Complimentary MoneyBack Points. Each eligible Cardholder is entitled to enjoy the New App Member offer once only during the Promotion Period. The New App Member offer only applies to the first 5,000 New App Members on a first-come-first-served basis. Offer 2 can be used in conjunction with Offer 1. In the event that the quota for Offer 1 is full, Cardholders are only entitled to receive the New App Member Offer of 1,500 Complimentary MoneyBack Points under Offer 2. The corresponding MoneyBack Points of "Citi Points Conversion to MoneyBack Points" will be immediately credited to the Cardholders' MoneyBack accounts. The corresponding MoneyBack Points of the Offer 1 and Offer 2 will be automatically credited to the Cardholders' MoneyBack accounts on or before April 30, 2019 for Cardholders who participate in the promotion during the period of January 14, 2019 to March 31, 2019 (both dates inclusive), and on or before June 30, 2019 for Cardholders who participate in the promotion during the period of April 1, 2019 to May 31, 2019 (both dates inclusive). MoneyBack is the largest retail membership platform in Hong Kong . By presenting your MoneyBack card or App at selected MoneyBack partner retail outlets, you can earn points and redeem them for cash coupons, selected products and merchant vouchers easily back home! Not a MoneyBack member yet?Sign up3now! 1. Applicable to Principal Cardholders of Citi Ultima Card, Citi Prestige Card, Citi PremierMiles Card, Citi Rewards Card, Citi Gold Card and Citi Classic Card issued by Citibank (Hong Kong) Limited only. Excludes Citi Rewards UnionPay Card, Citi Cash Back Card, Citi Clear Card, Citi Octopus Credit Card, Citi Cash Back American Express® Card, and all Citi Supplementary Cards and Citibank® ATM Card. 2. Your mobile number registered with MoneyBack has to be the same mobile number registered with Citi in order to proceed. 3. 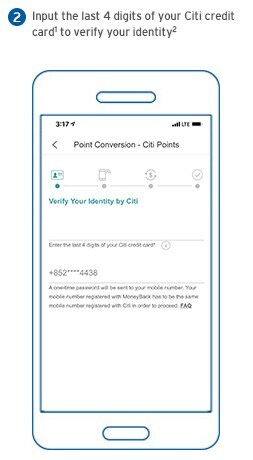 You have to register your MoneyBack account with the same mobile number as you registered with Citi in order to enjoy the Citi Points Conversion to MoneyBack Points Service. What is the Citi Points Conversion to MoneyBack Points? 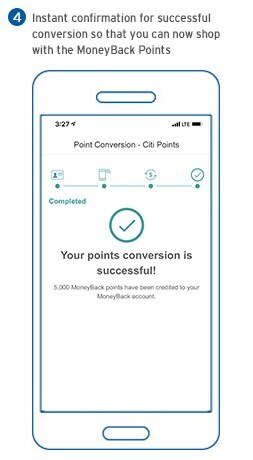 It is a new service that allows you to convert your Citi Points to MoneyBack Points at MoneyBack's official website or mobile application ("Online Platform"). It is applicable to Principal Cardholders ("Cardholders") of Citi Ultima Card, Citi Prestige Card, Citi PremierMiles Card, Citi Rewards Card (except Citi Rewards UnionPay Card), Citi Gold Card and Citi Classic Card issued by Citibank (Hong Kong) Limited ("Eligible Cards"). How do I access to the MoneyBack Online Platform? How does the Citi Points Conversion to MoneyBack Points work? The Cardholder is required to log in to his or her MoneyBack account at the MoneyBack Online Platform. If you don't have a MoneyBack account yet, please register by using your registered mobile numbers with Citibank. Upon the identity verification being confirmed, you can select the Citi Points amount to convert to MoneyBack Points. The amount of Citi Points redeemed will be deducted from your Eligible Card account. The amount of MoneyBack Points converted will be credited to your MoneyBack account immediately. My mobile number registered with MoneyBack is different from my mobile number registered with Citi. What should I do? You are advised to contact MoneyBack customer service during office hours to update the mobile number registered with MoneyBack to the mobile number registered with Citi. Once the update is completed, you may proceed to the points conversion. Should you prefer to update the mobile number registered with Citi to the mobile number registered with MoneyBack, please visit Citi's Forms Center at www.citibank.com.hk/form , where you can download, fill in and submit the "Change of Contact Details Form". Are there any restrictions on the Citi Points Conversion to MoneyBack Points? Yes. Each Cardholder can only perform the service once per day. The minimum and maximum MoneyBack Points that can be converted under each service are 5,000 and 50,000 respectively (subject to the Cardholder's available Citi Points in the Eligible Card account). What is the redemption ratio for Citi Points Conversion to MoneyBack Points? The redemption rate may vary by credit card types and may change from time to time. The exact Citi points required are based on the redemption rate displayed at the MoneyBack Online Platform at the time of redemption. Are there charges for using Citi Points Conversion to MoneyBack Points? No, there is no charge. When and how will the redemption show in my account? The amount of Citi Points redeemed will be deducted from your Eligible Card account. The amount of MoneyBack Points converted will be credited to your MoneyBack account immediately. Can the Citi Customer Service make the Citi Points Conversion to MoneyBack Points for me? No, please follow the instructions to verify your identity and select the amount of Citi Points you with to convert to MoneyBack Points at the relevant pages on the MoneyBack Online Platform. 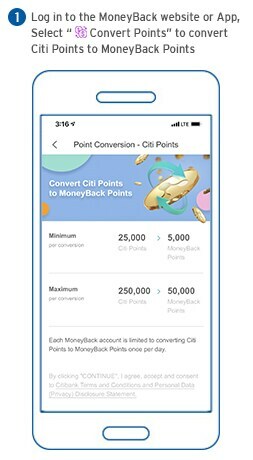 Citi Points Conversion to MoneyBack Points Service ("Service") applies to Principal Cardholders ("Cardholders") of Citi Classic Card, Citi Gold Card, Citi Rewards Card (except Citi Rewards UnionPay Card), Citi PremierMiles Card, Citi Prestige Card and Citi Ultima Card issued by Citibank (Hong Kong) Limited ("Citibank") ("Eligible Cards"). This Service is applicable to Cardholders' Citi Points Conversion to MoneyBack Points ("Redemption") via MoneyBack's official website or mobile application ("Online Platform"). To enjoy this Service, Cardholders must verify their identity by providing the last 4 digits of their Eligible Cards and their mobile numbers registered with MoneyBack (which must be the same as the registered mobile numbers with Citibank) to receive a One-Time Password, and the identity verification will be confirmed upon the One-Time Password being correctly entered. Cardholders can select the Citi Points amount to convert to MoneyBack Points and complete the Redemption under the Service. Citibank is not responsible for any failure to submit and/or process any Redemption arising from Cardholders' exit, voluntarily or involuntarily, during any of the steps illustrated under Clause 3, including but not limited to network disconnection, technical device malfunction or any delay, interruption or disruption of MoneyBack's Online Platform or system. Each Cardholder can only perform Redemption once per day. The minimum and maximum MoneyBack Points that can be converted under each Redemption are 5,000 and 50,000 respectively (subject to the Cardholder's available Citi Points in the Eligible Card account). The amount of Citi Points redeemed will be deducted from the Cardholder's Eligible Card account. The redemption rate may vary by credit card types and may change from time to time. The exact Citi points required for Redemption are based on the redemption rate displayed at the MoneyBack Online Platform at the time of redemption. Cardholders must promptly update Citibank of any change to their mobile number. Such updated mobile number must be the same as the registered mobile number with MoneyBack in order to enjoy the Service. Citibank shall not be liable to any Cardholders or anyone else for any losses or damages arising from the Service. Once the Redemption is confirmed, it is irreversible and it cannot be cancelled, returned, exchanged or traded for cash or other promotion. In the event of any discrepancy between the English and Chinese versions of these Terms & Conditions, the English version shall prevail. Unless otherwise specified, the initial promotion period is from January 14, 2019 to March 31, 2019, both dates inclusive, and is extended to May 31, 2019 (“Promotion Period”). Unless otherwise specified, the promotion applies to Principal Cardholders ("Cardholders") of Citi Classic Card, Citi Gold Card, Citi Rewards Card (except Citi Rewards UnionPay Card), Citi PremierMiles Card, Citi Prestige Card and Citi Ultima Card issued by Citibank (Hong Kong) Limited ("Citibank") ("Eligible Cards"). 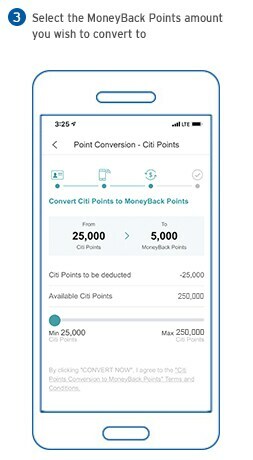 Offer 1: During the Promotion Period, Cardholders, who make a successful Citi Points Conversion to MoneyBack Points under the Service (as governed by “Citi Points Conversion to MoneyBack Points” Terms and Conditions), are entitled to receive 2,500 Complimentary MoneyBack Points (“Offer”). Each eligible Cardholder is entitled to enjoy the Offer once only during the entire Promotion Period. The Offer only applies to the first 5,000 participating Cardholders on a first-come-first-served basis. Offer 2: During the Promotion Period, Cardholders, who (1) download the MoneyBack mobile application (“App”) and sign up as New App Members of the MoneyBack Program (as defined in Clause 16) (the mobile numbers registered with MoneyBack must be the same as the registered mobile numbers with Citibank), and (2) make a successful Citi Points Conversion to MoneyBack Points under the Service on MoneyBack App, are entitled to receive extra 1,500 Complimentary MoneyBack Points (“New App Member Offer”). Each eligible Cardholder is entitled to enjoy the New App Member Offer once only during the entire Promotion Period. The New App Member Offer only applies to the first 5,000 new App Members on a first-come-first-served basis. Offer 2 can be used in conjunction with Offer 1. In the event that the quota for Offer 1 is full, Cardholders are only entitled to receive the New App Member Offer of 1,500 Complimentary MoneyBack Points under Offer 2. A. S. Watson MoneyBack (HK) Limited (“MoneyBack-HK”) will determine the eligibility of Cardholders to enjoy the Offer and New App Member Offer based on MoneyBack’s records. If Cardholders, who participate in the initial promotion period (from January 14, 2019 to March 31, 2019, both dates inclusive), are confirmed to be qualified for the Offer and New App Member Offer after verification by MoneyBack-HK at its sole and absolute discretion, the corresponding MoneyBack Points of the Offer and New App Member Offer will be automatically credited to the Cardholders’ MoneyBack accounts on or before April 30, 2019 by MoneyBack-HK. If Cardholders, who participate in the extended promotion period (from April 1, 2019 to May 31, 2019, both dates inclusive), are confirmed to be qualified for the Offer and New App Member Offer after verification by MoneyBack-HK at its sole and absolute discretion, the corresponding MoneyBack Points of the Offer and New App Member Offer will be automatically credited to the Cardholders’ MoneyBack accounts on or before June 30, 2019 by MoneyBack-HK. Citibank shall not be responsible for any matters in relation to the fulfillment arrangement of the Offer and New App Member Offer. For disputes, please contact MoneyBack-HK. The MoneyBack Program is a customer loyalty program operated by A. S. Watson Group. Unless otherwise specified, Terms and Conditions for the MoneyBack Program apply. For details, please visit https://www.moneyback.com.hk/setting/tnc.